In this article we wanted to evoke the atmosphere and show some of the novelties that were presented by short at Drupa, for all those who have not had a chance to come and a reminder to those who were. At the Kodak booth an absolute hit was a digital printing machine Kodak NexPress SX 3900. For this, in practice, proven machine, Kodak has introduced a new option – an optional tray that allows printing on substrates up to size 356 x 914 mm (356 x 660 mm in automatic duplex mode), and gold, pearl and neon-pink toner as an option for the fifth printing unit. With the previously launched option for a fifth printing unit such as Clear, Red Fluorescing, Dimensional Clear, Black or Light RGB toners, gold, pearl and neon-pink toner bring an unprecedented range of options that adds to standard CMYK print a new value, thus enabling the expansion of business and increase revenue to the owners of Kodak NexPress digital printing press. These three options will be available on the market early next year. Furthermore, Kodak introduced the Kodak Flexcel Direct, a machine for direct engraving of flexo printing forms. With laser engraving of elastomer is obtained a printed form with great endurance. The machine is capable of producing sleeves and panels. It is technology that many flexography printers eagerly await. Great interest of visitors to the booth of French company MGI Digital Graphic Technology has caused a new MGI JetVarnish 3D, machine for digital partially coatink with digital inkjet coating technology, which in the latest version, first presented at Drupa, can now be made, and dimensionally, ie partial relief coating at a speed of 3000 sheets per hour for format 52 x 105 cm. 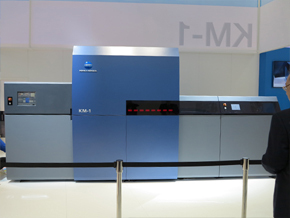 Konica Minolta is at its booth presented a prototype of a new digital ink jet printing machine KM-1 inkjet technology that can print up to B2 format sheets stacked at a speed of 3300 sheets per hour. Resolution of 1200 x 1200 dpi provides exceptional printing quality. In addition to the proven digital production presses bizhub PRESS Series C 6000/7000 and C8000, Konica Minolta has introduced a new model and prototype bizhub PRESS 1100 C, which will allow printing of high quality prints at a speed of 100 A4 / min, regardless of the grammage of the paper. The launch of this machine on the market is expected over the next year. 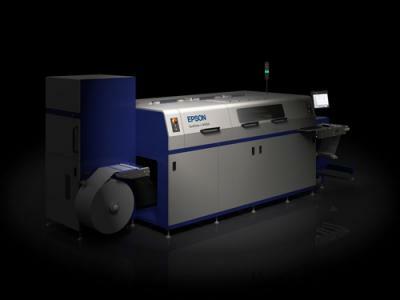 Epson has introduced a new generation of ink jet printing machine for labels from the roll to roll with printing capability of white ink Epson SurePress L-4033AW. This is a digital printing machine for printing labels on all materials commonly used in the production of labels, from paper to foil. With six printing units, CMYK + orange and green, now there is and white ink for printing on transparent and metallic materials. Most manufacturers of labels showed interest in this machine because of the quality of prints and affordable prices. Techkon this year had a larger booth than usual and a large attendance. 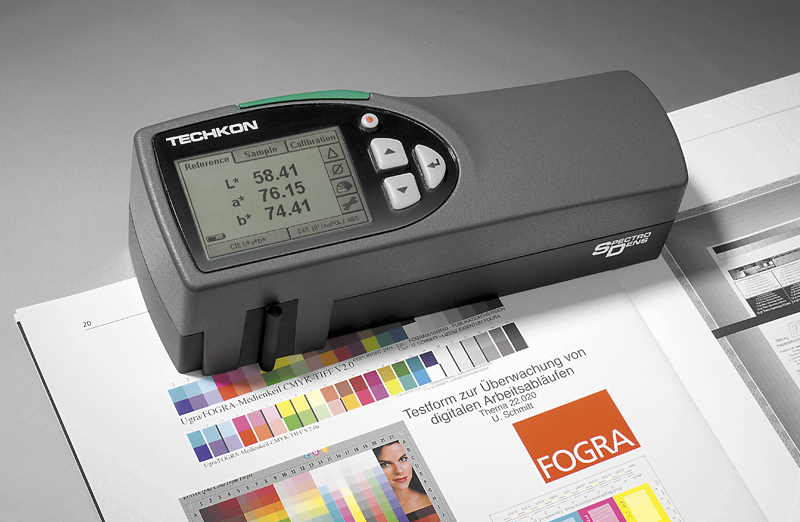 Of the many innovations the biggest attention was on new model of spectrophotometer SpectroDens Premium, who was redesigned, with color display and plenty of new features. What is interesting to the younger generation is applications for the iPhone, whit which we can control the registry on the print. From novelty on boot of British company Morgan, a leader in the manufacture of machinery for processing plants for digital printing, we single out a new range of polyurethane binder (machine PUR adhesive binding): DigiBook 150, 300 and DigiBook 450. By its very reasonable price, along with the proven quality of the Morgan processing plants machines, these machines for PUR binding will certainly find its place in a number of digital printing factories, as well as conventional printers that have a need for quality binding.